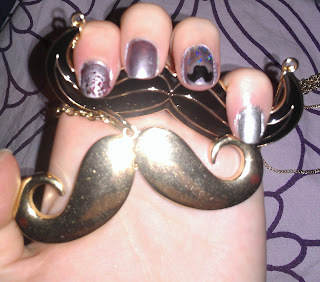 Julia's Fashion Minute: My nail with a moustache. My nail with a moustache. On my nails I wear Pedal to the metal [ Sally Hansen]. I also applied A cut above [Essie] on my index finger. 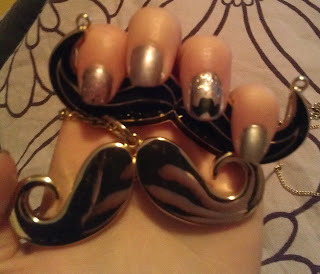 And Save me [OPI] on the bottom of my ring finger and on the top I made a moustache with Lady in black [OPI]. I applied as topcoat, on my ring finger, Matte me crazy [NYC]. And on my pinky I wear Her Majesty with on top Matte me crazy. Somewhere this week I will do a review on Pedal to the metal and on Matte me crazy -winks-.